"The Wellington County Museum and Archives is a National Historic Site. It is located in a building that stands as the oldest remaining rural House of Industry in Canada. It was built in 1877 as a "Poor House" or place of refuge for the poor, homeless, and destitute people in Wellington County. 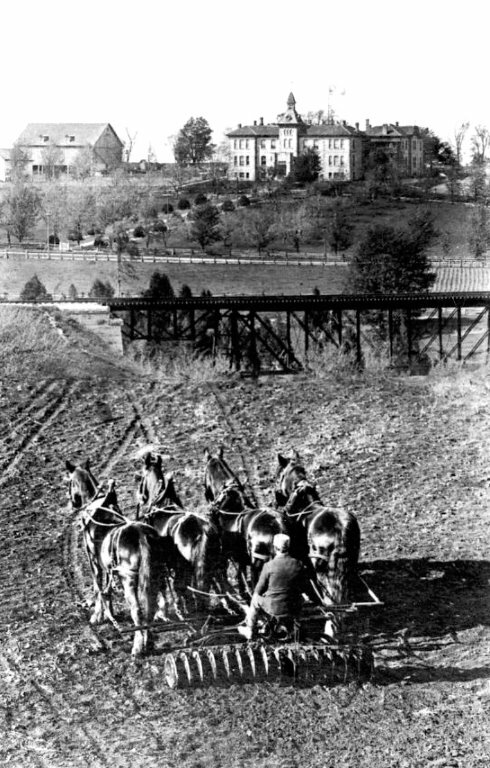 It operated as a Poor House and Industrial Farm until 1947 when it became a County Home for the Aged. In 1972 it was transformed into the Wellington County Museum and Archives." Image of Wellington County House of Industry and Refuge from south side of Grand River, ca.1907-1914, unknown photographer. The barn, which was built at the same time as the house, is shown off to the left in both the photo above and the one to the left. People with nothing make do with whatever comes to hand. They tend to be creative and innovative. Also, nothing was thrown away. This is probably why the piece of wood on the right came to be in the barn in the first place. As Susan Dunlop, curator at the Wellington County Museum & Archives, tells us, "We found this plank of wood stored above the granary in the House of Industry barn at the Wellington County Museum and Archives. The barn is original to the site and was built at the same time as the House of Industry and Refuge (1877). 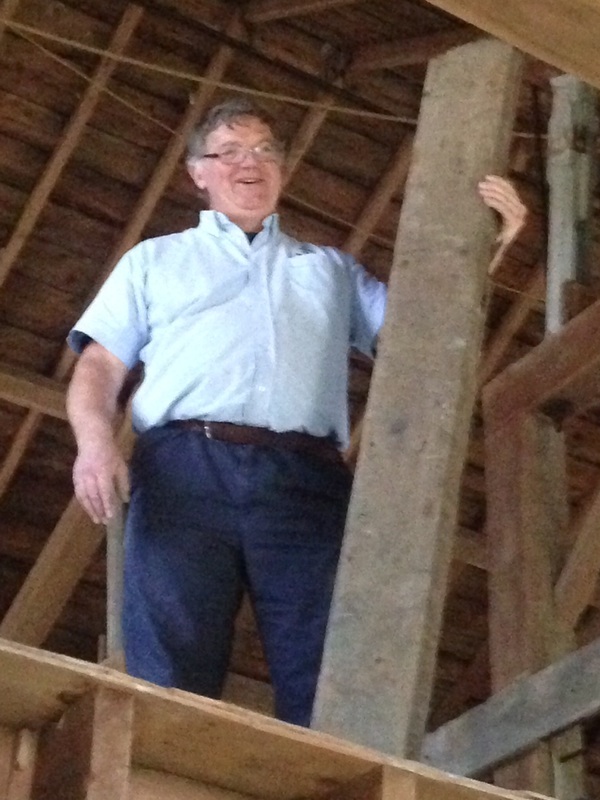 A working barn for nearly a century, it underwent many renovations as farming practices changed and improved. The evidence of whitewash on the board indicates that it was probably used in the ground floor stables during one of the many upgrades to its stable equipment. The final upgrades took place in 1937 when Beatty Bros. Ltd of Fergus was contracted to install its latest stable equipment ." 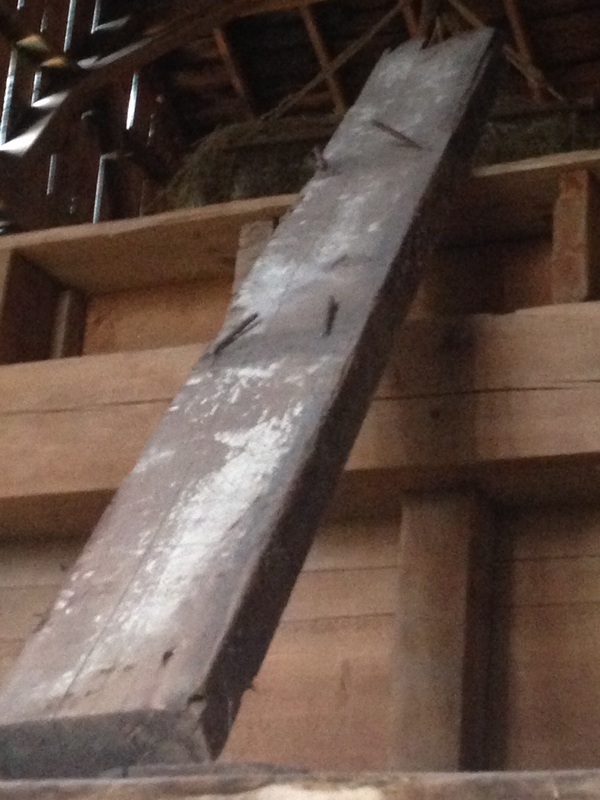 Plank of Western Red Cedar found in the granary. A better look at the cedar. One of the things that immediately struck me was the density of this cedar. There are many year rings to the inch. They are almost too tightly packed to count with the naked eye and only with this blow-up image was I able to get an approximate age for the original tree. My conservative estimate is that the tree was about 700 years old when cut. After removing the nails, which took some considerable persuasion, I cut the board into 4 pieces of about 15" in length. From these I planned to make two bowls. 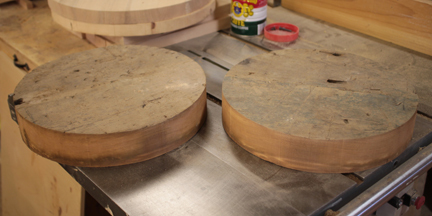 The two turning blanks made from the cedar. On the right here, I show the completion of the turning of the font side or top of the bowl. I have carefully left the original surface untouched. The more the piece is refined, the greater the contrast between the worn and re-worked parts. The piece that we have followed in the videos above is on the left. The turning on the right was made from the second blank. The video on the below covers the preliminary steps on this journey. Here I am turning the back or underside of the bowl. 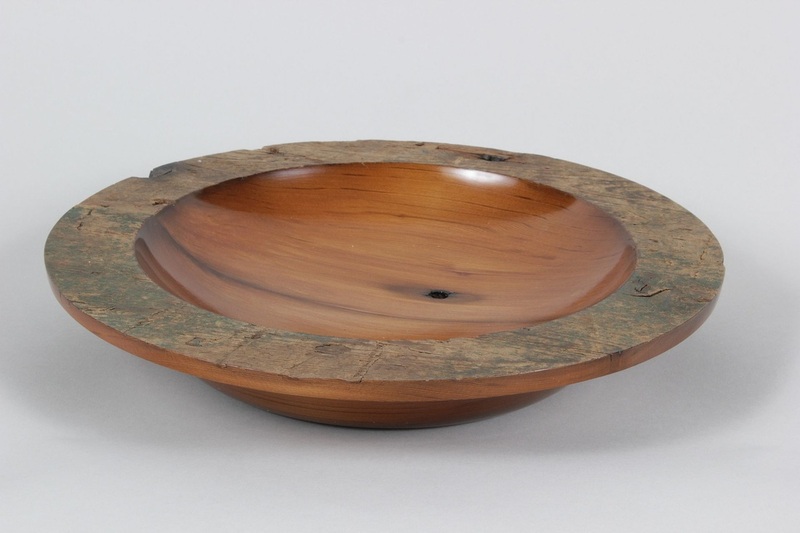 I give the bowl its final shape which accents the textured surface on the rim. 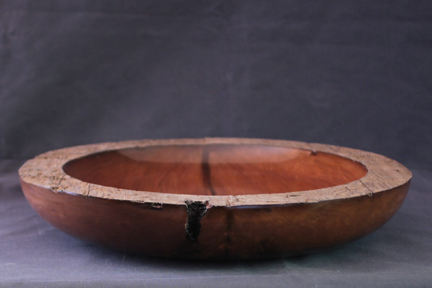 By removing the material under the rim I give the bowl a certain lightness. Once I am happy with the shape of the piece, I move on to the sanding and finishing stages. Sanding is tedious and dusty and finishing is just the opposite. Finishing is where the piece comes to life and sometimes comes close to what was originally envisaged. These pieces are for sale. If you are interested, please go to the price page for more information.